At PEDIGREE® we believe that every dog deserves a loving home, and that every dog deserves leading nutrition. That's why we've created complete pet food for adult dogs. 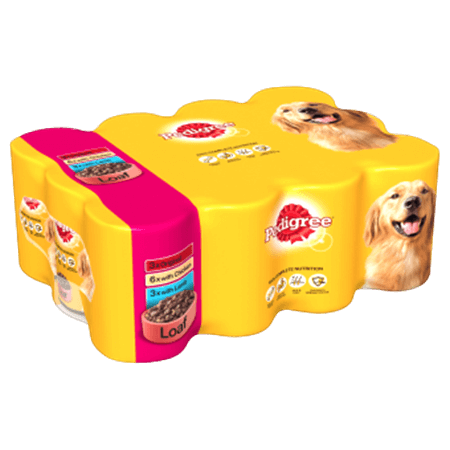 Pedigree Tins Mixed Selection in Loaf is rated 3.0 out of 5 by 3. Rated 1 out of 5 by michelle6 from Disgusting I have been buying your pedigree food and products for over 10 years with my dogs. Last week I bought a pack of dog food and it seemed fine, apart from having some dents in the cans.. obviously we did not think anything of it. I had fed my dog 3 of these cans already ... to then open the 3rd and find it all mouldy inside, there was no cracks in it and it was still sealed .. obviously i threw it straight in the bin, and opened the next 2 cans and they did not smell right at all so threw them away too. Obviously because these cans were dented they had gone off even though they was fully in date. With me feeding my dog 3 of these cans and not knowing anything was wrong it made my dog ill and gave him really bad diahorrea. I am very very disappointed in pedigree. Rated 3 out of 5 by Cmsm from Low meat content Tried this for a little while as our dog is super fussy. The meat content in each tin is minimal therefore my dog isn't getting the appropriate nutrients, her nose is cracked and very dry skin. Would not recommend. Rated 5 out of 5 by donna t from excellent taste I buy this product week after week and my dogs love it, and they are really fussy dogs, its easy to break it down too as they are small dogs and struggle to eat larger chunks.